Smoky Quartz is an excellent grounding stone. It gently neutralises negative vibrations and is detoxifying on all levels, prompting elimination of the digestive system and protecting against radiation and electromagnetic smog. Smoky Quartz disperses fear, lifts depression and negativity. It brings emotional calmness, relieving stress and anxiety. Promotes positive thoughts and action, and alleviates suicidal tendencies. Dispels nightmares and manifests your dreams. 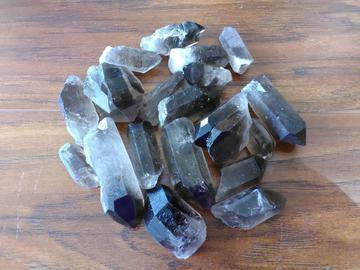 Smoky Quartz aids concentration and assists in communication difficulties. Smoky Quartz dissolves cramps, strengthens the back and fortifies the nerves. It is particularly effective for abdomen, hips and legs. Relieves headaches, back pain, eases muscular spasms. Smoky Quartz benefits the reproductive system, the heart, muscles and nerve tissue. It regulates liquids within the body and aids assimilation of minerals. Size Range: 1" - 2"